Christmas theme activities, printables and centers that can be used when planning lessons and curriculum for preschool, pre-K and Kindergarten children. Find literacy activities including alphabet, oral language, and emergent reading, plus math activities including counting, number recognition, and creating sets. Patterning, memory games, shapes and color recognition are also here, and even a few coloring pages. Download instantly, in Adobe PDF format. Many resources are free; others can be accessed in the Member's Area, or in the KidSparkz activity pack store. Christmas ornaments - What comes next? Cut and paste to complete the pattern. Emergent reader featuring Rudolph the Red-Nosed Reindeer, Christmas, and color words. Christmas colors recognition and matching. 6 pgs, 12 colors. Sorting stars by their attributes - size and color. 5 Christmas posters or greeting cards printables to decorate, color and give. Christmas cookies cut and sort activity. Complete the AB patterns on each candy cane. 2 pg. Christmas ornaments counting 0-20. Recognition, sequencing, number lines, matching etc. 8 Christmas themed pages cutting straight and curved lines. After cutting, make collages and puzzles. Lotto concentration matching activity for Christmas. Christmas tree sequencing activity. Cut out trees and arrange in sequential order. I have included a color copy, a b/w copy, and a coloring page. Color and count the decorations on the Christmas tree. Set of Christmas number flashcards 0-20, plus a set of 10-frame flashcards, 0-20. Christmas reindeer large letters flashcards. Great for making games, and bulletin boards. Large numbers 0-20 with a Christmas theme. Use for making activities and room decor. Christmas 10-frames counting 0-10 cards to make center. Become a KidSparkz member. These activities can be downloaded in the Member Library area of the site. Christmas theme number practice to 20 set of printables. $3.00. FREE to MEMBERS in member area. Christmas lights alphabet order and recognition center and printables - upper and lower case in color and b/w. 48 pages. $3.50. CHRISTMAS theme alphabet upper lower match. Use for matching, letter sequencing, flash cards, games, bulletin board and room decor etc. 41 pgs. $3.00. 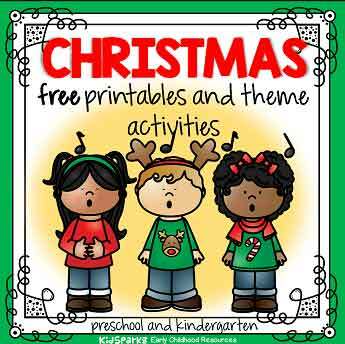 Collection of popular Christmas songs with coordinating activity printables. 35 pgs. $3.50. CHRISTMAS masks and puppets activity pack. Oral language and dramatic play activities for early learners. 27 pages. $3.50. 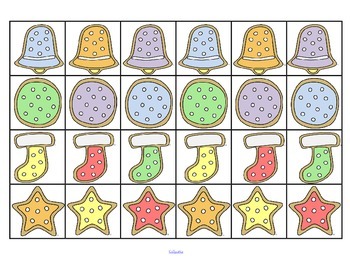 Christmas activity pack no prep printables for preschool and Kindergarten - 93 pgs in b/w. $6.50. ​Christmas name posters: 3 sets of letters, 3 different designs – stocking, tree, and ornament. 79 pg. $3.50. FREE to MEMBERS on the member Christmas theme page. The focus is on 32 words associated with Christmas – recognizing the pictures, learning the vocabulary, and linking the pictures with the spoken and written words. $4.50. FREE to MEMBERS on the member Christmas theme page. Christmas theme no-prep printables 1-20. $3. FREE to MEMBERS in the Member Area. CHRISTMAS big theme pack for preschool - 122 pg. Hands-on centers to make. $7.50. Pre-K Theme for a Day Series - a collection of low-cost downloadable mini teaching topics/units that are focused towards preschool and pre-K learners.